As alchemists looking for the “lapis philosophorum”, in the early morning we arrived at the festival main hub gate with an enormous need of information gathering. “When we see engineers and scientists working with new technologies we usually ask ourselves what is the meaning and the purpose of their research. For good reasons – too often – the development of new technologies has been seen has a kind of luxury attitude for rich kids or american or european universities, but we rarely ask which is potential of the research in fields in which a help is really needed. There are a lot of different projects that are aiming to do something that we call social business, making business by helping people. 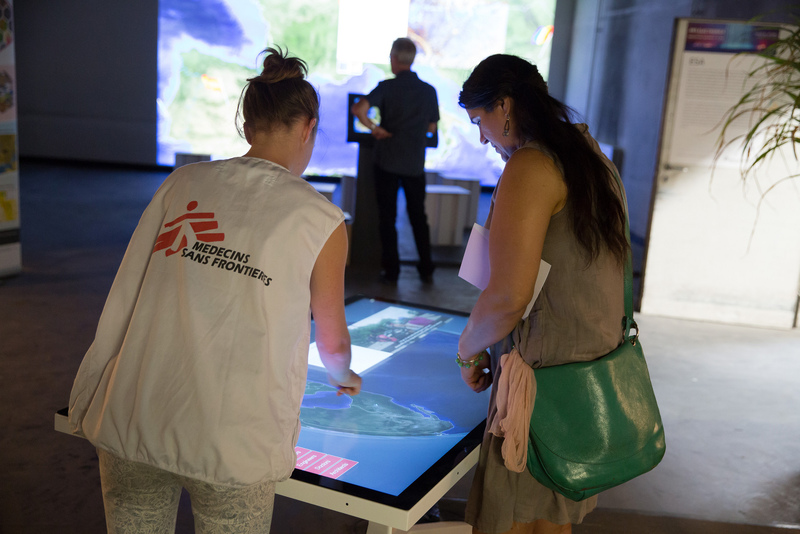 An example is the project by Doctors Without Borders in which they explain to people the way new technologies can help them in their daily work. Doctors Without Borders – Médecins Sans Frontières – is an international medical aid organization that helps people in need, victims of catastrophes and armed conflicts. Similar possibilities can be pictured when we think about what we can really do with drones: there is a very nice project where people are developing drones to map territories and detect land-mines. 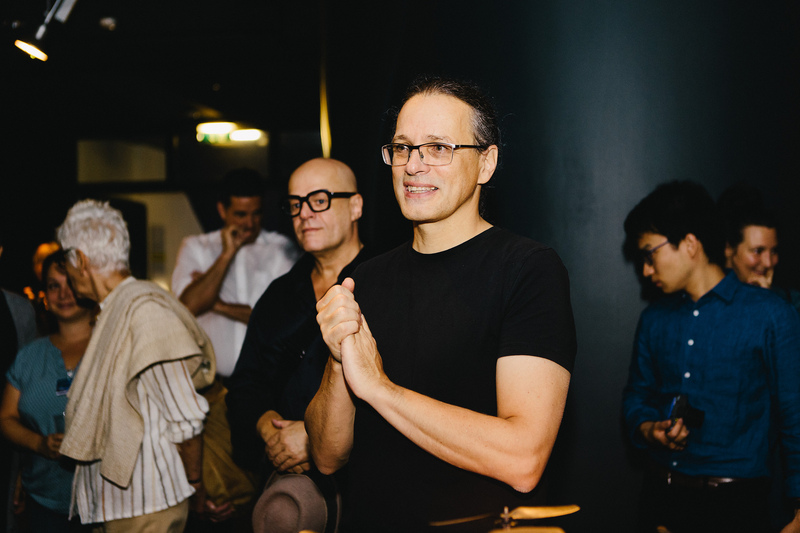 This social and sustainable vision is a daily business at Ars Electronica and it’s about how we can re-utilize our creative and innovative ideas for application in the market”. 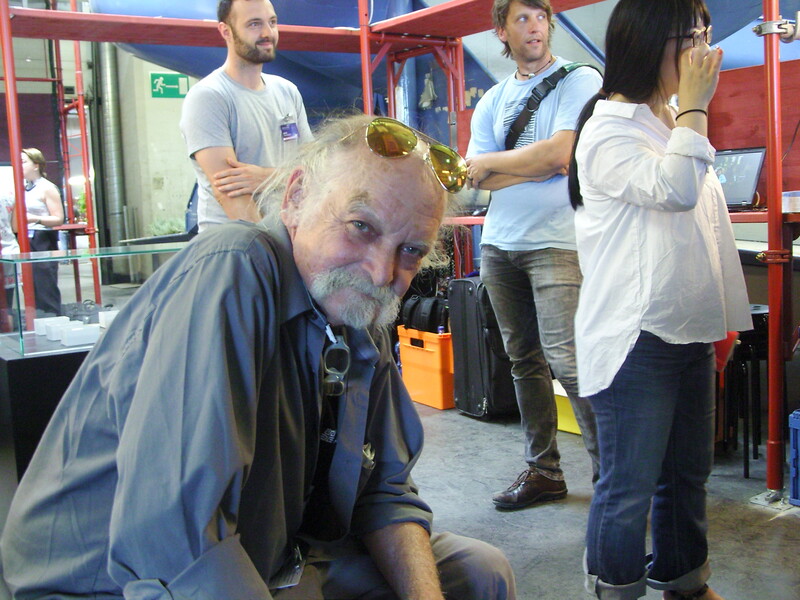 “The 34-member staff of Ars Electronica Solutions gleans ideas, concepts and developments from throughout the Ars Electronica context and transforms them into trailblazing (media) applications customized for culture and commerce. During the tour we had a stop-over at the lab that the artist (or most likely pioneer) Joe Davis set-up at the first floor of Postcity. sculptural methods in laser carving at University of Cincinnati Medical Center Laser Laboratory and Bell Telephone Laboratories, Murray Hill, NJ. In 1981 he joined MIT Center for Advanced Visual Studies as Research Fellow and Lecturer. In Poetica Vaginal (1986-7) and Rubisco Stars (2009) Davis sent the most powerful and lengthy radio messages ever transmitted to other stars. Astrobiological Horticulture in 2016 to create organisms suited for survival on Mars. After a first gaze at his instrumentation we suddenly felt like being thrown in a Marvel movie. In the work Bombyx chrysopoeia, made in collaboration with Tara Gianoulis (USA) and Mariko Kasuya (Japan) at Harvard Genetics and Hideki Sezutsu (Japan) at the Japanese National Institute of Agrobiological Sciences in Tsukuba, Japan, he created genetically modified silk moths (Bombyx mori). As a result of few stages of manipulation… these silk fibers integrate selected metals such as gold or platinum. With this method, many other metals and metal compounds can now be integrated with silicateinized silks to produce fibers with unprecedented material properties for both art and science. These may have a number of applications. gold recalls episodes of magic and legend that go back deep into history. Experiments planned for the Festival included real-time biomineralizations of transgenic silks. In Astrobiological Horticulture, realized in collaboration with James Monaghan, Ashley Seifert, Jennifer Bender, Jeff Nivala, Seth Shipman, Conor Camplisson, Emma Kowal, Tom Bork and Bill McCarthy, Davis explores the possibility of creating organisms that can survive in widespread deposits of cold Martian brines now known to exist just below the Martian surface. Since the number and the complexity of the “Artworks” showcased at the Festival appeared both like non-computable variables for an ordinary human, unless he had previously earned few PhD in multiple-science, before covering some other – in my opinion – noteworthy works – i think it’s time to move up and start doing some “ordinary” reflections. Since i crossed the Postcity hall i felt – as i previously wrote – that it wouldn’t have been a common experience. 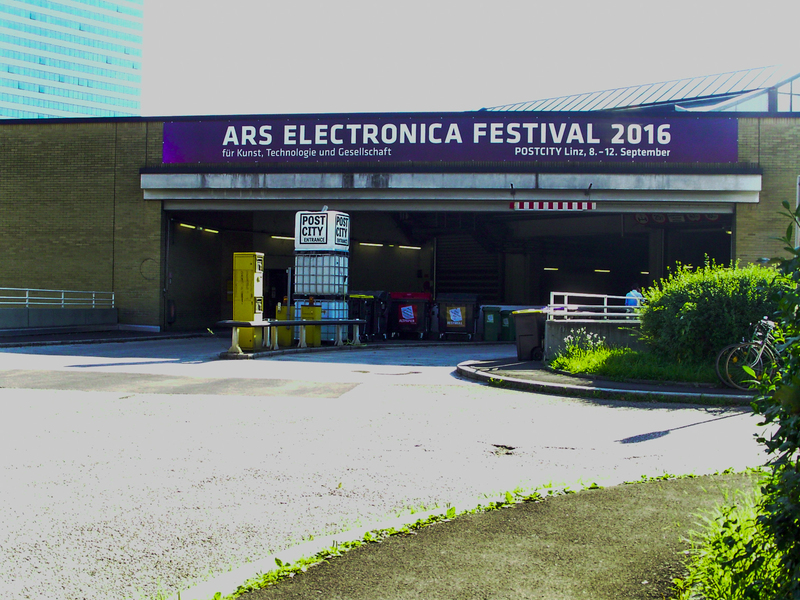 In my previous Ars Electronica Festival i learned that it was a “place” where we could imagine possible scenarios of near futures. But – this year – the imagination process was almost cut off because it was just like stepping directly into the future… and i’m not sure if i would describe it as the best possible future. Many shadows were wandering… in my mind. There were artists who told me they were not artists at all, but biologists, and some of them seemed to be unaware of the bioethical involvements of their practice. It’s few years that artists are working in the field of bioart, spreading the word about facts that are morally debatable. These artists usually work in collaboration with scientists, who are the holders of a kind of knowledge that can be highly redeeming or destructive. But we know, artists have a peculiar sensitivity and – above all – every artist has a creative licence, while if scientists know how to manipulate matter in a way that today can be – for some reason – useful when applied in the art fields, they still strictly seem to belong to their category because – while looking for discoveries – they’re not used to recognize any superior right over the successful result of an experiment. That’s why – sometime – their activity is under control. In some way contemporary artists want to learn to use a new kind of matter – life – that only scientists can manipulate, while scientists want to gain a new freedom of expression. I wonder what kind of society would give scientists a creative unlimited licence. An enlightened or a crazy one. I prefere stop wondering… You answer, please. From another point of view, with the evolution of transdisciplinary practices, there’s an emerging need for clear international rules, at least to be sure that the next human hybrid will not be realized in the studio of Damien Hirst. We must also recognize that a new Renaissance wind is blowing through the planet and that some contemporary Leonardo da Vinci is probably already between us. He will – for sure – succeed to turn more than a piece of lead into gold, so the only set of problems will be around the definition of gold, a definition that he could – in the worst case – just inherit from an unruled civilization. All in all, if Art has to provide intellectual nourishment – food for thought – our first day at Posticty made our head full.